Heeft u een vraag voor At Casa Guesthouse Amphawa? At Casa Guesthouse Amphawa, gebouwd in 2013, is een aanwinst voor Amphawa en een slimme keuze voor reizigers. Het levendige stadscentrum is slechts 6 km verwijderd. Dankzij de praktische locatie liggen alle belangrijke trekpleisters in de buurt van het hotel. Het At Casa Guesthouse Amphawa biedt tevens vele faciliteiten om uw verblijf in Amphawa zo aangenaam mogelijk te maken. Het hotel heeft een uitgebreid aanbod aan services, inclusief gratis wi-fi in alle kamers, wi-fi in openbare ruimtes, roomservice, familiekamer, barbecuefaciliteiten. Treed binnen in één van de 12 uitnodigende kamers en ontvlucht de dagelijkse stress met een breed scala aan voorzieningen, zoals internet (draadloos), draadloos internet (gratis), airconditioning, balkon/terras, televisie. Of u nu van fitness houdt of gewoon lekker wilt ontspannen na een drukke dag, het kan allemaal in dit hotel dankzij faciliteiten als massage. 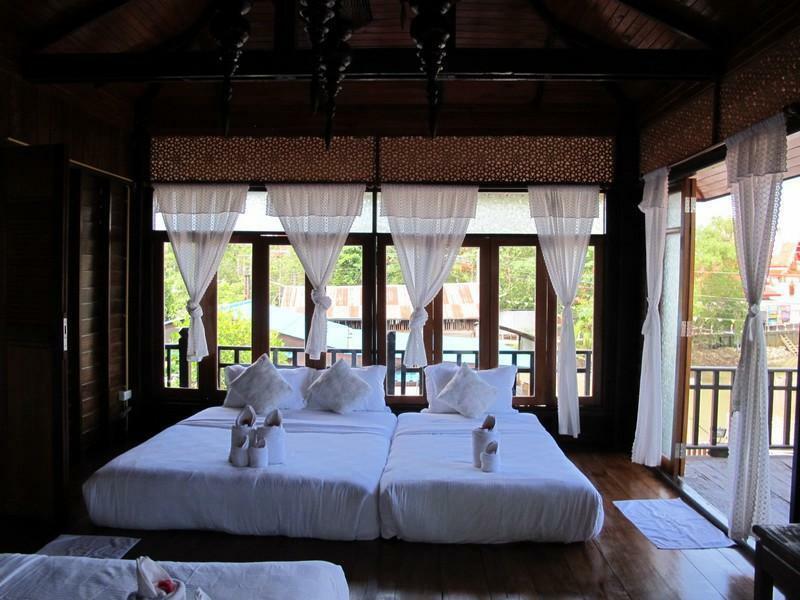 Geniet van ongeëvenaarde dienstverlening en de prestigieuze uitstraling van het At Casa Guesthouse Amphawa. Het hotel is centraal gelegen in Amphawa en toch rustig doordat er geen looppad voor het hotel langs gaat. De kamers zijn mooi en erg sfeervol ingericht. Enige minpuntje is dat de ramen niet kunnen worden verduisterd. Het terras aan de khlong is mooi en ontspannen. Het ontbijt is redelijk. Op verzoek maakten ze voor mij vegetarische rijstsoep. De centrale locatie, vriendelijk personeel, knusse omgeving. Ons verblijf was perfect. De ligging was geweldig en een heel knus en romanties hotel, gelegen aan de floating market. Zeer aan te bevelen voor de romantische gasten. Heerlijk rustig gelegen aan de klong. Te regelen om vanaf hier per poot naar de drijvende markt van Damnoensaduak te worden gevaren. A nice old converted home with a few painting issues. The canal-side veranda is disconnected from the market, making it far less busy than market center guesthouses. I stayed during the week and food choices were limited, though other nearby restaurants were ready. Room 11 has some paint issues on the outside wall that the staff is aware of. The stay was quiet and comfortable, exactly what I needed. Stay there with party of 4 on the third floor. Hotel location is very good, short walk to the market. Staff are friendly and offer us boat service and making merit in the morning. Chill out area by the river is very nice. Downside is cleanliness. Mat in one room is used and hotel does not change. I like baht room design but its floor has lot of stain, sink as well. Maybe the design is the obstacle of cleaning process. Bath towel is aged but smell good. Overall, we have a good stay there. For a super low price, you get air-conditioning, a decent mattress, TV, wifi, free dinner and breakfast, (albeit simple, home-cooked ones), what more is there to fault? Mosquitoes coming into the room, water drainage that was less than ideal in the shower room, noise from the neighbouring rooms, these were slight inconveniences that I put up with, considering the positives I mentioned. we booked the two rooms that were each good for 6people. The balcony was a plus as it provided my family a place to gather and chit chat at night. In the day, you can easily spend the afternoon downstairs at the riverside common area reading or just simply napping. Overall, The place is not luxurious but clean and good enough for a 3 star hotel. Overall is good. Location is perfect. 1-2 minutes walk to the floating market. Only that the hotel has no sound proof. Cant blame the hotel because its a building built by the river. Material is wood. Can clearly hear people walking like gorillas and talking like wood pecker all the way from morning until night (except when they sleep). Especially if there is a group of inconsiderate people checking out of hotel at wee hours in the morning. Rooms are good, decoration is special and moden! They offer not only free Breakfast, also free homemade noodles and dinner too when it meets the right time everyday! Staffs there are very very nice! If there's something need to improve maybe there was smell from the bathroom's pipe, when I take shower, the water goes down from the pipe and a bit smell came up. But I know it's a floating market so there maybe some limitation for the house. So it's still fine for me. And also I am definitely will come back and stay in this guesthouse again!!! Lovely guesthouse ever, really in love with this guesthouse. best service and feel like you stay at home. Owner is very friendly. Guesthouse is very close to floating market. Highly recommend to someone who want to touch in Thai tradition culture. I have been travelingany countries. This hotel is the best one I had. The staff really helpful and friendly. The room comfortable for sleeping and clean. The lobby in front of river quite at nigh, you could stay all night long. Not just this, they prepare drink when you arrive, at night they cook hot soup noodle if you are hungry. Free drink and fruit if you want. For all it's best experience for hotel staying. If you come if stay here and get best time of holiday. Thank you we did great time with your service. The property locates near Amphawa Floating Market (1 - 2 Mins walk). Dining at the guesthouse is quite good due to the balcony is on the riverside but the menu is limited and out of order. However, guest still can buy some from the market or roaming merchants. Room is incompletely cleanup and many room facilities is out. Water heater is not working. Service quality warm and nice but quality still need to be improve (eg. speed of responsiveness). All-in-all, if you looking for value deal and slow life, this is some place you might get into your consideration. Location is good. You can walk to floating market. But if your luggage is big you Should take a tuktuk bus. The view is good. You can lie down in the first floor seeing the river. Food is good. They provide free dinner and breakfast. But I suggest order the dish. Because we ordered 9 dishes. It's very delicious and cheap. The people is good. The boss lady is very kind. She call a mini van for us to go back to Bangkok. And my friend's cellphone left on that bus. She help us find it back. And you can do massage in the hotel. It's good and convenient. In a word, it's a very nice hotel.